The + operator is gone... So what? Just the other day, Google turned off the + operator. There was a bit of a kerfuffle about it in a few blogs, and Danny Sullivan got bent out of shape about it, but relatively few people noticed that the behavior of the double-quote operator also changed at the same time. Unfortunately, many people believed that a search like [apples +macintosh] would require the term to be in the search results. That's NOT what it did. 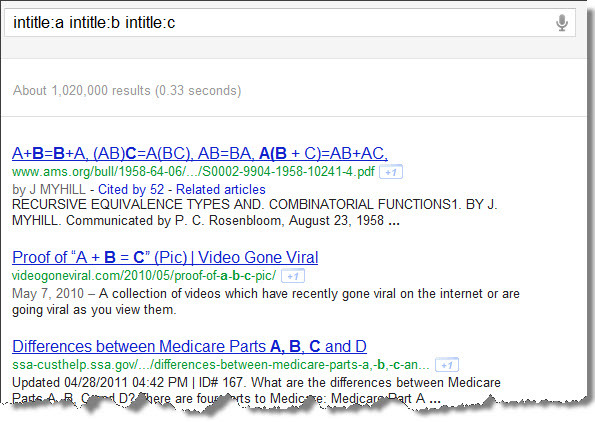 While the + term would usually be in the results, it was only there because you'd put it into the query! NOW... we no longer have the + operator. So what can you do if you want the same effect? Answer: Use double-quotes for single terms. You'd write that query now as [apples "macintosh"], and it'll give you the same effect as what the plus used to do. Some people complain that it's an extra character to type. Geez. Give me a break--you're going to complain about 1 extra character? The double-quote mechanism is actually pretty interesting. For instance, did you know you can do the following kinds of a query? Does this help you understand the new power of double-quotes? Yes, the + operator is gone, but what we now have makes a bit more sense. Answer: Where did that crazy uniform come from? 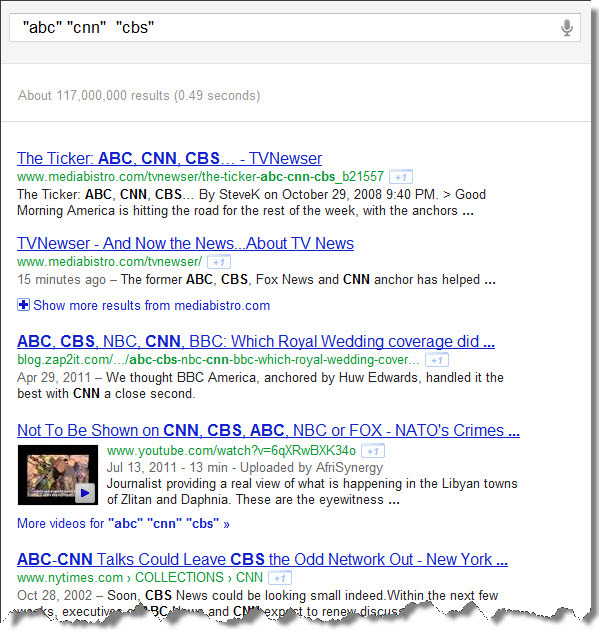 One of the promises of a search engine is that it would make the information landscape flat. That is, you could do your search and you wouldn't need to know all of the fiddly little details about what databases are available and what each of them has in stock. It hasn't quite worked out that way. I content that while Google has done a great job of flattening, it hasn't--and cannot -- remove the need to know what kinds of data is possible. My friend Eisar had a fantastic G+ post that illustrates this point perfectly. In his post he pointed out the wonders of SFGenealogy.com, a site that collects lots of historical and archival materials about San Francisco and the Bay Area. As his example, he pointed to their recent posting of telephone directories from San Francisco. They started with the directory from 1850 by Charles B. Kimball. Who knew that telephone directories had authors? Or that they used to have a preface. The 1850 preface begins "It is not to be expected, in a city like this, where whole Streets are built up in a week and whole Squares set up in an hour--where the floating population numbers thousands and a large portion of the fixed population lives in tents and places that cannot be described with any accuracy..."
The phone books (mostly the equivalent of Yellow Pages) have intriguing history built into them. In the 1907 edition, one year after the great San Francisco earthquake, many of the phone numbers are listed as "Temporary." No kidding. They also have pages that list social clubs (such as the "Bunker Hill Association" to "inculcate a feeling of patriotism and commemorate the anniversary of the ever eventful Battle of Bunker Hill, June 17th..."), street crossings and associated building numbers, and of course, listings of ordinary people and their occupations. Some of these are abbreviated in intriguing ways. "Stenog" for "stenographer" or "tmstr" for "teamster," etc. Some of the abbreviations are beyond my understanding. What is as "lab" or a "tmatr"? "Lab" probably isn't a "lab assistant" so I'm guessing it's laborer. But I haven't found the master index yet, so I'm not really sure. And... it's useful to know a bit about how to search. For instance, you can use site: to restrict your search to a specific year. Example: [ site:www.sfgenealogy.com/sanfranciscodirectory/1885/ grenade ] will find the "hand grenade" fire extinguisher makers in the city. The number after the underscore character is the page number. Hence, this is the directory from 1885, page 537. I'll give them kudos for their scanning as well. It's beautifully done (although I WOULD like a simple way to get to the full-text, rather than having to pull it from the PDF). I figure one of my little jobs is to help people understand what's possible and what's NOT possible with Google search. To do this, I read a lot of blogs (and LOT of blogs) and try to extract the sense of what people are thinking about how search works. There is no SAFESEARCH: operator. 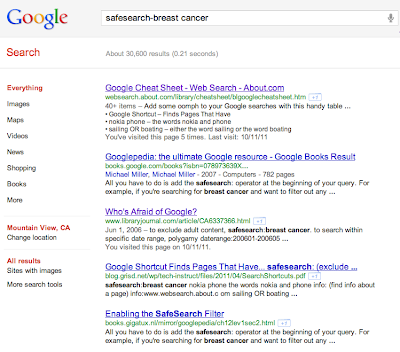 Yes, I know, there are about 1 million results for the search [ safesearch operator ], but I'm telling you. It doesn't DO anything. [ safesearch:breast cancer ] and [safesearch-breast cancer] (I'm using this because it's the standard example used to "demonstrate" how it works. You can see that the results are the same. IF safesearch: was a real operator, you'd expect them to be different (because the hyphen wouldn't mean anything in that context, it's just ignored). But you can't quite reverse engineer operator arguments from the query string. It just doesn't work that way. In any case, this is a broken meme. 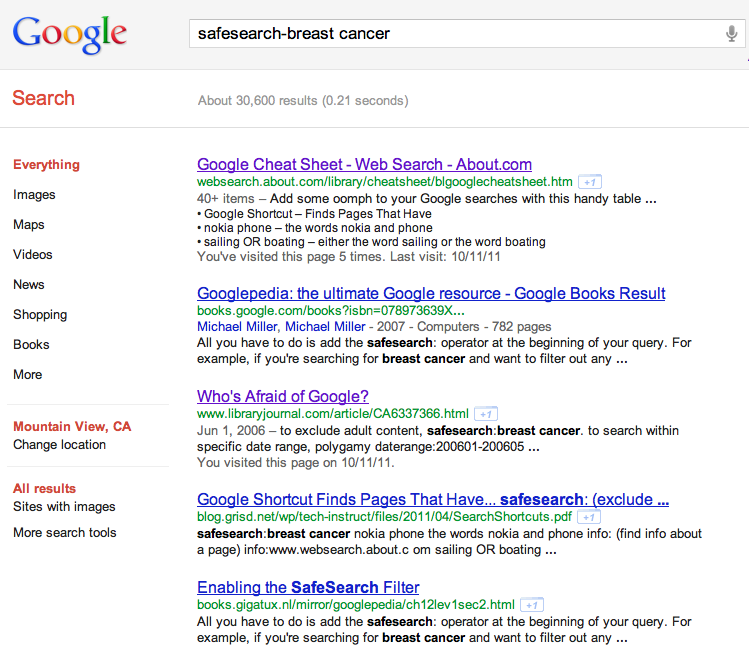 Safesearch: doesn't exist. 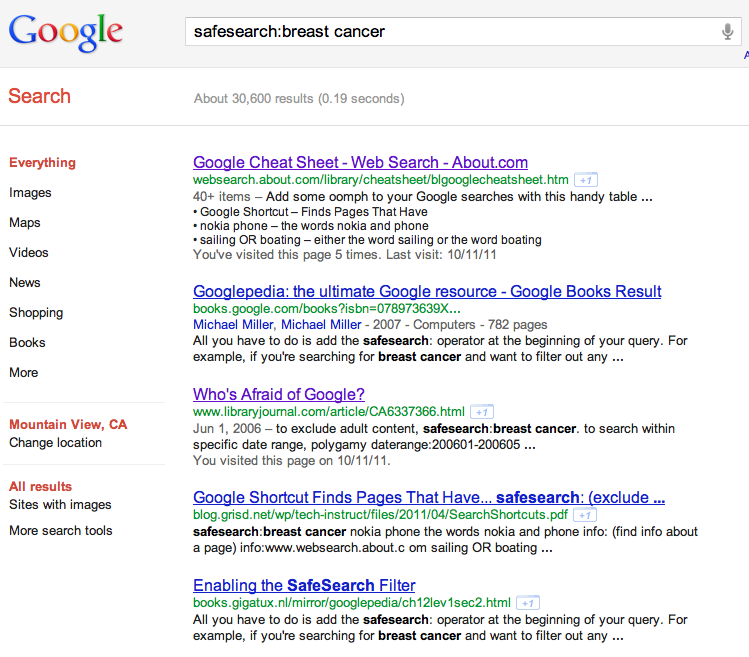 Use the safesearch setting instead! 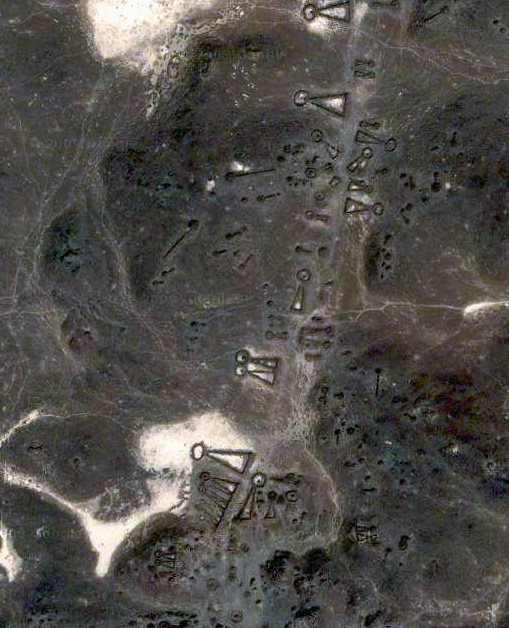 Answer: What are those things in the desert? 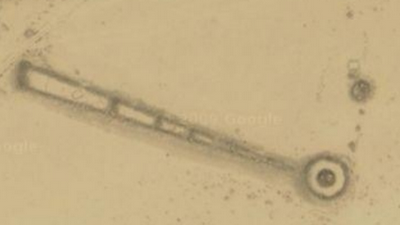 Which led me down the rabbit hole of reading about strange geoglyphs around the world, of which these were probably the most interesting (at least at the moment as I was reading). 1. google maps "loc: 26.00053,40.48997" => "al hayit"
"The most striking are the so-called “kites,” the remnants of long stone walls most likely built by groups of hunters to trap game; the walls outline the shape of a child’s kite. But the kites are huge: The “body” is a wall enclosing a corral-like space often 100 or more meters (328') across. The “tails,” two or more walls running out from the head, are typically each a few hundred meters long, but they can be as long as two or three kilometers (1.2–1.8 mi). On the ground, however, kites are almost impossible to find, because the walls, built of basalt boulders, are only about a meter (3') wide and their surviving height is seldom over half a meter, making them nearly invisible on a landscape already thickly strewn with the same rock. Interestingly, this is also the same time the Peruvian Nazca plain lines were also discovered. I've been trying to find the original reference to the 1920's aviators who noticed the kites, but still haven't been able to track it down. Anyone have an idea? (Later: My friend Lee pointed out that I could find the original article in the first volume of the journal "Antiquity"
You can't help but wonder how much other stuff is out there waiting to be found. Wednesday Search Challenge (10/5/11): What are those things in the desert? To begin with, I still haven't figured out the symbolism of the Tyn Church multi-steeples. In fact, I haven't even found a decent explanation of why they're so complicated. We'll work on this going forward. Stay tuned. Today's search challenge is in this picture. Any idea what it is? (Or can you find the best possible theory about what it is?) I'll tell you a couple of things about it... The structures shown are ~2000 years old (give or take). There's a very nice solution to this little search challenge. In central London, just across the bus-clogged street from Victoria Station, there is a very modern newsroom. It's a large, open-plan space full of desks arranged like the spokes of a wheel pivoting around the central conference desk. Each line of desks has two monitors at each place, and a autumnal scattering of newsprint broadsheets all around, lending a sense of functional chaos to the orderly and ergonomically correct work stations. There’s a sense of new-media about the place. Lots of stories being written around the clock, many Twitter feeds examined, telephones everywhere and even a tiny studio just off on the side so new media journalist can do a quick standup video or audio recording when needed. With the radial layout, it’s a bit of a panopticon design, shades of Jeremy Bentham and the all-seeing eye, although in this case it’s intended to help people on different desks work together efficiently rather than the pervasive monitoring of inmates as Bentham proposed. 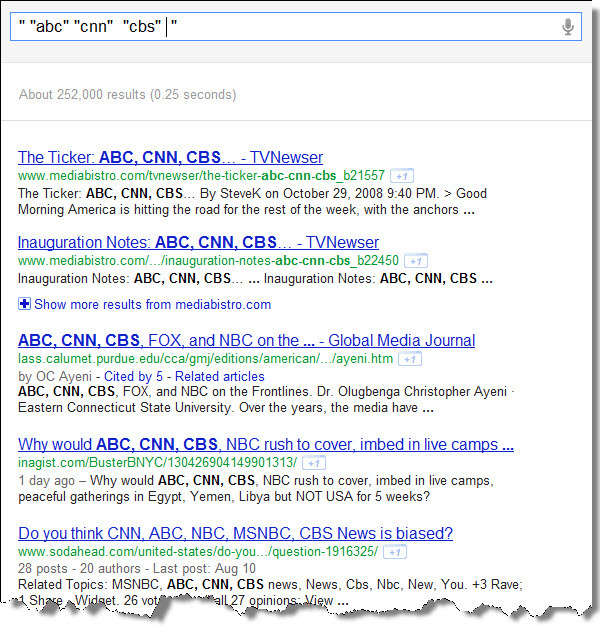 I was in the newsroom to teach journalists a few of the finer points of search. Of course they all use Google everyday, so everyone knew many of the basics, but once outside of their comfort zone, I realized once again that even the best investigative reporters know only a fraction of what’s really possible. One more time I see that while they’re often great reporters and have a drive to get-to-the-bottom of a story, but even the young reporters tend to follow the tropes and patterns of previous years, and that limits them. I did an interview on Czech television that was good fun, and then the next day I was in Hamburg, answering the same questions about what makes someone a good searcher on Google, but this time with a slightly more German twist. Sample question: “How can someone be the most efficient searcher possible?” That’s an interestingly engineering-style question. It’s very Googley, but also very different from questions I got from reporters in Dublin. There the questions were more about the user’s experience—“how can we be sure that the searcher is really happy with what they find?” I don’t mean to caricature, but there’s a reason the stereotypes are the way they are. Hamburg… Dublin… they have very different outlooks on life. I suspect they also search differently, although I didn’t do any studies to find out. On the other hand, in the Swiss newspapers I became the “Chef für Kundenzufriedenheit,” literally, “chief for customer satisfaction,” which is not quite the way I think about myself, but I can see how they got that from “user happiness,” which IS in my job title. It’s a distinction that matters in English, but does it work that way in German? Don’t know. which always gives you a page full of nice diagrams, each with the parts all labeled. Alas, when you do this in German, it doesn’t work. Turns out that the German word “diagramm" (that’s their spelling) has a slightly more limited meaning than “diagram” in English. 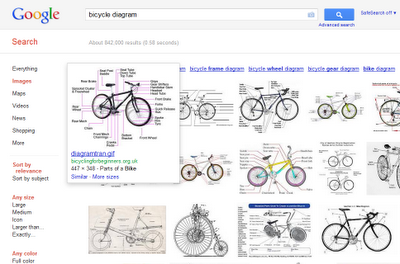 (You have to use the German word “schema” to get labeled diagrams.) Likewise, a word like “serious” (“serious” or “seriös” in German) has several meanings in German. But you can’t say (in German) “he was seriously ill,” that sense of “serious” as “substantial in number or size” doesn’t carry over into German. I shouldn’t have been surprised, really. I know all about false cognates (example: Spanish “dia” means “day” but has no relationship to “diary” in English, it just looks like it does). But somehow had the impression that a relatively simple word like “diagram” (a word that IS a true cognate across language pairs) would also copy all of the subsenses of the word as well. Nope. Not true. What this tells me is that language variations are even more subtle and profound than I’d thought. It gets even trickier when you try to remember to account for loan-words across languages. The technical term for an oft-used bicycle frame alloy of chromium and molybdenum is (in English) Chrome-moly. But in Spanish it’s “Cro-Moly”—which makes *half* sense. “Chromium” (EN) is “cromo" -- but molybdenum is “molibdeno” (ES), so you’d think the Spanish tech name would be “Cro-Moli.” But it’s not: the term “Cro-Moly” is half-Spanish, half-English. Who thinks this stuff up? Answer: Who owns that piece of land?